We’d love your help. Let us know what’s wrong with this preview of Bacon Pie by Candace Robinson. Kiev Jimenez is a theater geek who loves him some Shakespeare and taking care of his pet armadillo. He has one set goal in life: obtaining the role of Horatio for the Hamle Lia Abbie has the easy life—kicking it back with old school video games, hanging out with her best friend Barnabas, and alternating her living schedule between the apartments of her two dads and her mom. To ask other readers questions about Bacon Pie, please sign up. Do we know when/if a hard copy/print version is coming out? I see one listed here on goodreads, but when I've tried to order it only ebooks are available still. Thanks! In the history of titles, has there ever been something more appealing than Bacon Pie? I can only imagine the hilarity and the food consumption that must have occurred when Candace Robinson and Gerardo Delgadillo focused on proposing potential titles. For me, bacon and pie are delicious thoughts... but putting them together? Wow, I’m not sure how that would taste, but it certainly captured my attention. Both the title and the book… now let’s get into the real review. Let’s start with the basics o In the history of titles, has there ever been something more appealing than Bacon Pie? I can only imagine the hilarity and the food consumption that must have occurred when Candace Robinson and Gerardo Delgadillo focused on proposing potential titles. For me, bacon and pie are delicious thoughts... but putting them together? Wow, I’m not sure how that would taste, but it certainly captured my attention. Both the title and the book… now let’s get into the real review. Let’s start with the basics of how I chose this young adult contemporary fiction novel published just a few short months ago. I’d seen it advertised on many social media platforms and I followed one of the authors blogs, but I didn’t jump on the initial bandwagon only because my backlog of TBRs, ARCs and other book OCDs had to be sorted and cleaned. I finished that grandiose task right before vacation and took this delight with me to Italy. I devoured it in less than 4 hours between a train ride from Amalfi to Tuscany and an afternoon sitting near the Arno river banks in Siena. What a perfect way to enjoy ‘la dolce vita’ while reading a touching, comical, and thoroughly engaging book. The story is told through the multiple perspectives of a mid-to-late teenage groups of friends in a typical high school setting; however, it’s not your standard ‘jocks versus nerds’ or ‘life is hard as a teenager’ coming-of-age story. It’s much stronger… there’s a ton of family dynamics, old rivalries, crushes, and emotion built into a backdrop full of diversity and wit. Between Spanish translations and conversations with armadillos, I can’t decide which character I love the most… or which love story is the most endearing and reflective. All of the characters are charming, even when they’re misbehaving or doing something foolish. Their relationships with their parents echo beautiful sentiments, but also show a tougher side of why we all ‘loathe our parents’ from time to time in that age range. Kudos to the authors for bringing out both sides of the puzzle it is to be a hormonal teenager with a chip on our shoulder but also a need to be loved. And let’s talk about that concept: authors… plural. Yes, it’s a co-written book. I know from first-hand experience how difficult it can be to write one on your own, and while the thought of someone taking on half the work seems easier, I know it’s probably harder than to do it on your own. Merging styles, voices, and patterns. Keeping facts straight. Disagreeing on direction or tone. But never did I see anything in the novel where I thought… ‘hmm, this feels different.’ What a great way to produce a truly a solid book that will entertain all types of readers and bring tons of smiles to their faces. It is now officially out in the world! This my book—well half my book, and it's up for preorder now!! You get bacon, humor, and romance—what's not to like? 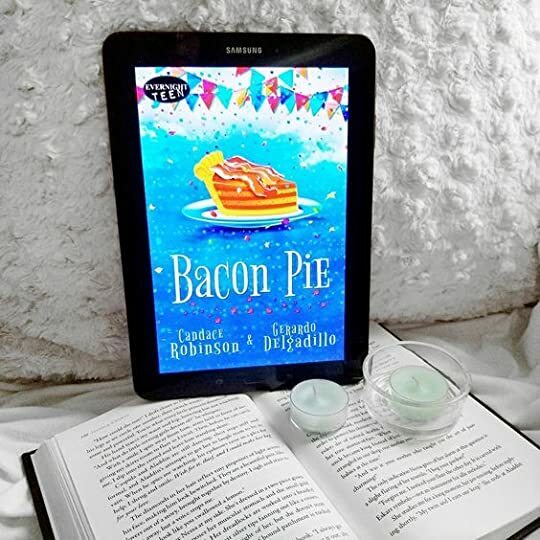 Bacon Pie by Candace Robinson and Gerardo Delgadillo is a young adult contemporary romance story that will be sure to give readers a few chuckles. The book moves at a fast pace as it alternates the point of view between the characters. Kiev Jimenez loves acting and Shakespeare and wanted nothing more than to get the part of Horatio in the school production of Hamlet. But Kiev’s dream went downhill when he found out he’d missed the email for the Horatio try outs. Lia Abbie is more into her old sch Bacon Pie by Candace Robinson and Gerardo Delgadillo is a young adult contemporary romance story that will be sure to give readers a few chuckles. The book moves at a fast pace as it alternates the point of view between the characters. Lia Abbie is more into her old school video games than Shakespeare so when Kiev asks that she may be named after Ophelia the encounter doesn’t go well. Afterwards Lia and Kiev find themselves in the principal’s office getting the punishment of working the Piggy Palooza Festival. What neither expected was their time together turning into something more. Bacon Pie was such a fun read. There were plenty of times I found myself chuckling and the authors even get bonus points for making a recipe at the end of the story bring a few laughs showcasing it in a whole new way. The characters in here are a bit of a case of opposites attracting after they’ve been forced to spend some time together. While I thought the story was fun and the characters likable I also have to give credit for adding in the cutest and most interesting pet I’ve come across in a while. In the end I’d definitely suggest picking this one up if a fan of a fast paced young adult contemporary read. I received an advance copy of Bacon Pie from the author, thanks for allowing me the early read Candace Robinson. Never call Lia “Ophelia,”…never mind it is her name…just don’t do it because “accidents” can happen. One such accident put Lia and Kiev in the principal’s office, discovering their “penance” of the “accident” would be working as volunteers at the annual Piggy Palooza Festival. As crazy as it seems, that festival would be a life-changing experience for both Lia and Kiev, and in turn for some of their nearest and dearest friends. Are you ready to relive the high school experience? Relax...not the Never call Lia “Ophelia,”…never mind it is her name…just don’t do it because “accidents” can happen. One such accident put Lia and Kiev in the principal’s office, discovering their “penance” of the “accident” would be working as volunteers at the annual Piggy Palooza Festival. As crazy as it seems, that festival would be a life-changing experience for both Lia and Kiev, and in turn for some of their nearest and dearest friends. Are you ready to relive the high school experience? Relax...not the nasty high drama, but the parts that were fun, funny and simply memorable, as enemies become friends and friends become more and all things piggy will bring laughter to your heart and heartburn to your stomach. Simply delightful, fabulously sweet and the perfect slice of the best parts of youth, BACON PIE by Candace Robinson and Gerardo Delgadillo is like the sun shining through on a cloudy day, complete with the smiley face we all once drew! I received a complimentary ARC edition from Candace Robinson! Ok...I’m getting ahead of myself. If you read the nice little summary that was written to tell you what the book is about, then you know that Kiev and Lia have to volunteer at this festival as a punishment for I always thought I’d like anything as long as you wrapped it in bacon. That is, until Kiev and Lia went to the Piggy Palooza Festival and I read about some of the bacon things they had there. No! I’m not going to tell you! You have to read the book!! But, I will never think that way again. I received and advanced copy of this book for my unbiased opinion. I love this book. These characters are so easy to like and laugh at. I feel like when I am able to get emotions pulled from me while reading...well I just feel like it means it’s a great book. I could see and even imagine the smells for these settings. The Author’s of this book seriously made a master piece. I’m left wanting to read more. Pick up a copy and find out for yourself if you don’t believe me. 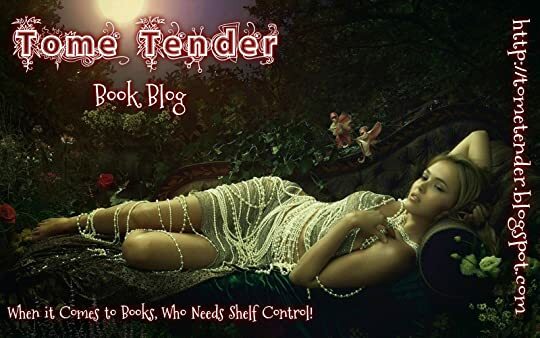 Having read and enjoyed Candace Robinson’s earlier work – Quinsey Wolfe’s Glass Vault, Hearts Are Like Balloons, and The Bride of Glass – I was interested in seeing what her next book would bring. As soon as I saw the synopsis and cover of Bacon Pie my mind decided this was going to be one super cute read. Despite how cute it seemed, I had my usual moment of tentatively regarding a cowritten book. Most cowritten books I have read have flowed really well together, but it’s the bad ones that stand Having read and enjoyed Candace Robinson’s earlier work – Quinsey Wolfe’s Glass Vault, Hearts Are Like Balloons, and The Bride of Glass – I was interested in seeing what her next book would bring. As soon as I saw the synopsis and cover of Bacon Pie my mind decided this was going to be one super cute read. Despite how cute it seemed, I had my usual moment of tentatively regarding a cowritten book. Most cowritten books I have read have flowed really well together, but it’s the bad ones that stand out to me – due to this, I always fear the worst. Add in the fact I have never read a Gerardo Delgadillo book before and I was doubly nervous. What would I get from Candace Robinson working with an author I have never read before? Turns out, it was yet another of those cases where the prior bad left me with unnecessary worries about the good. Candace Robinson and Gerado Delgadillo work really well together, leading to a story that flows wonderfully as we make our way through the story. It also left me with the desire to jump into other Gerado Delgadillo books. I will be completely honest, I wasn’t completely sucked into this one at first. It took me a few chapters, where I was interested but not crazy in love, before I finally fell into the rhythm of this one. This may be a reflection of how I’m not the biggest reader of young adult contemporary. I enjoy young adult novels, but I lean more towards fantasy and science fiction for the genre; I enjoy contemporary, but I lean more towards new adult and adult contemporary over young adult. Thus, it’s a bit of a grey area for me – something I pick up occasionally, but not something I spent a lot of time reading. I think it just took me a while to organise my mind so it recognised I was reading something I do not read all that often. Once I was sucked into the story, though, I could not put this down. It quickly became a book I was happy to sit and read in a single sitting, curious to see how everything came together. Being a book that covered so many important topics, I was unable to turn away until I knew how every detail played out. When I say it deals with important topics, do not worry about a book that preaches or shoves far too much in your direction – it subtly deals with the topics, making them important points of the story without waving a giant flag that says ‘this is something you need to keep in your mind in everyday life’. It’s wonderful when young adult books are able to incorporate such things, especially when it is done so in a way that it does not feel forced, when it feels completely natural within the story. The storyline itself was a lot of fun. There was plenty of drama and entertainment throughout, the story having enough to keep you turning the pages. There are some of the usual things you find in young adult contemporary novels, but there’s also plenty to make this book unique. The characters were also enjoyable. There was one side character I really wanted to strangle – not one of the troublesome ones, either, one of the important ones. However, by the end of the story he had grown on me and I could deal with him in small doses. That in and of itself is an amazing feat – to turn a character from someone I could not stand to someone I could deal with in so few pages. Super cute and fun YA contemporary romance told from dual points of view. <3!! A delightful, fun, quirky, AWESOME read full of vibrant characters and awesome dialogue!! Seriously, Lia and Kiev’s internal monologues are absolutely HILARIOUS. Get ready for loads of fun, hilarity and yes, romance, because this book delivers on all fronts. I found it’s like good wine - it gets better with ever chapter, until it wraps up with a perfect ending that leaves you smiling. Did ever punching someone on face have changed your life? Here it happened with these two main characters of the book- Lia and Kiev. Bacon Pie is sugary sweet YA contemporary novel, a love story of Lia and Kiev. A story of two enemies turned to lovers through a cringe worthy but life changing Piggy Palooza Festival. It’s funny, refreshing, entertaining high school and bit of family drama. Kiev Jimenez- was (in Cole’s language) ‘Tex-Mex’ (Mexican living in Texas) nerd who loved theater and Shakespeare plays. He was nice decent guy whom you can’t help but love. There was almost no flaws in this character. I loved his calm, understanding, and caring nature. I also liked how he understood emotions of his family and gave them space when needed. I liked him even more during Piggy festivals. Lia Abbie- She was total opposite of Kiev. She was gaming freak, tomboyish and so grumpy in initial chapters. She hardly liked anyone outside her circle which included Barnabas (Lia’s best friend), her mom and two dads. Initially I couldn’t understand why she didn’t like anyone, she was so opinionated even though she hardly talked to anyone but eventually she started to open up and made new friends. I liked changes in her and her life during and after Piggy festival. Her family dynamic was great and I loved how her parents managed to live in same apartment complex even after separation. Cole (Kiev’s best friend) was funniest character but his habit of speaking full name was little annoying. No wonder Lia disliked him. I never expected he would take up Kiev’s advice and would focus on one girl, it was quite surprising. I loved all secondary characters and their role in story. Specially Barnabas and his two little sisters. Isn't that cover beautiful? I so loved it. This was my fourth book by Candace and second by Gerardo and I could see glimpse of both authors in the book. The story was narrated alternatively by Kiev and Lia that gave pretty good idea on what they thought and felt for their family, friends and each other. Authors described all characters so perfectly that I felt like I was watching them very closely. They felt so real and were easy to connect with. My favorite part of the book was Piggy Palooza Festival, which was center point of the book. Usually I say story revolved around main characters but it would be fair to say here that story revolved around this Piggy Palooza Festival. It was fun and entertaining to read specially that Bacon Pie competition and Bacon eating contest. Humor was so effortless and looked silly at some point but still it made me smile. Twist and turns were nice and smooth, also surprising at points. Loved the climax and end of the book. Ooh and that epilogue was something new. I liked that authors decided to give it different voice. A quirky and quick-reading romp through the punchy politics of romance in a small town Texas high school, Bacon Pie by Candace Robinson and Gerardo Delgadillo serves up a sometimes sweet sometimes snarky slice of enemies to lovers adventure, spiced with Shakespeare and a plethora of pork products. A charming collaboration, Bacon Pie conjures all the drama of high school with a breezy narrative flow, and offers a colorful cast of relatable, distinctive, and diverse characters with fully rounded s A quirky and quick-reading romp through the punchy politics of romance in a small town Texas high school, Bacon Pie by Candace Robinson and Gerardo Delgadillo serves up a sometimes sweet sometimes snarky slice of enemies to lovers adventure, spiced with Shakespeare and a plethora of pork products. 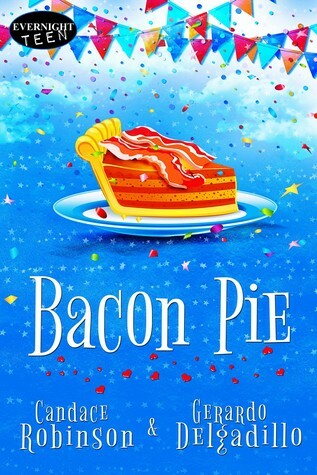 A charming collaboration, Bacon Pie conjures all the drama of high school with a breezy narrative flow, and offers a colorful cast of relatable, distinctive, and diverse characters with fully rounded story arcs and snappy one-liners. Why did the armadillo cross the road? To get some Bacon Pie! I had to say that because Pepe is El Guapo, la estrella de la historia. I own half of this bacon pie. I mean, I co-wrote this book with my "partner in write," Candace Robinson. A bacon tsunami, an armadillo, romance, and a whole cast of quirky characters wait for you! Bacon Pie is about a high school student from a small Texas town whose life we get to eavesdrop on. It seems so genuine as she plays video games and bounces between her mother and two father's household. When theater geek, Kiev enters the story things get pretty entertaining. Fate and their bad behavior bring them both to the principal's office. They are forced to work together or face suspension. It is charming and witty and the perfect romantic read! The dialogue and characters keep this entert Bacon Pie is about a high school student from a small Texas town whose life we get to eavesdrop on. It seems so genuine as she plays video games and bounces between her mother and two father's household. When theater geek, Kiev enters the story things get pretty entertaining. Fate and their bad behavior bring them both to the principal's office. They are forced to work together or face suspension. When I first heard the title of this book, I couldn’t help be curious about it. While the Young Adult contemporary genre isn’t really my style, I still wanted to check this book out because I’ve been following (one of) the author(s) since her first book was published. As always, the writing style and quirkiness throughout this book do not disappoint. The reader is able to quickly immerse themselves in the story without much obstructing their path. Bacon Pie is set in a small town in Texas, where the hot and dry climate is palpable. Because the setting takes place in a realistic present-tense, not a lot of world building is necessary to immerse the reader in the plot. Notably, the region is important, as its population has a lot of diversity. I find that contemporary books do not require much prompting in order to get the plot moving. The same is true here, as Bacon Pie, from the opening scene to finale feels as though I've stepped into the character's lives and understand exactly where they are at. The pacing remains consistent, with few valleys of slowness here and there. The point-of-view alternates between Kiev and Lia. I felt that Kiev was definitely the main character between the two, but they both were well-developed for the plot. Kiev Jimenez comes from Latino origins. At home, he, his father, and sister only speak English, while at school he speaks English. Kiev's mother left a few years ago, and they haven't seen her since. Her leaving caused a fissure between him and his sister Vi. Amidst juggling his strained homelife, Kiev has a deep passion for theater and is rather knowledgeable. His goal is to become Horatio in his school's play. Lia (Ophelia) Abbie has grown up with two dads. Spending most of her time with her close friend Barnabas, she immediately reveals her feelings about Kiev and his close friend Cole. Cole Novotny serves as the comic-relief throughout the story. Constantly stalking the school halls for his next love interest, he relies on Kiev to reign him in. While he is comical (at times), his immaturity is apparent in the way that he handles each and every situation. Monica Serrano serves as a partial antagonist. Interested in Kiev, she causes jealousy to blossom between Cole and Kiev's relationship. Later on, when a certain young woman changes her perspective of Kiev, Monica becomes the "competition." Diversity is represented racially and sexually. Majority of the more prominent characters come from families with diverse traits. Kiev and Monica are both Latino/a, and Barnabas comes from a culturally diverse family as well. Lia has two fathers (along with a mother who isn't in the picture much). While this isn't as big of a theme, I thought it mentionable. Kiev's mother left his family a few years back, causing a big change to take place in his daily life. His sister Vi was deeply affected and retreated within herself. Struggling to cope with the loss of her mother, Vi spirals into her own bought of depression and harmful coping methods. The repercussions of her methods estrange her from others and make her difficult to interact with. In the end, she was able to reach out to her mother in order to tell her how she felt about the fact that she left them behind. I think the way the affected characters handled this aspect ended in a positive light. Assumptions between characters are constantly causing issues. Because no one directly confronts others, assumptions are made. This is most apparent in Lia's opinion of Kiev. However, when she learns the truth behind what she thought was true, she realized that what she had made to be a big issue, was nothing at all. ⇒ The writing is seamless and there isn’t an obvious gap between each writer’s voice. ⇒ It was an easy and quick read. ⇒ The incorporation of Shakespeare. ⇒ At times the plot would lag a bit and wasn't constantly engaging me. However, I think this is preferential on my end, rather than it being the fault of the book. Overall, I thought this was a likable read. While I don't normally read Young Adult Contemporary, I find that when I do, they serve as great palette cleansers between dense and lengthy books. It's nice to be able to pick up a book and finish it in nearly one sitting, due to its likable characters and dash of quirkiness. While I didn't care for the amount of language used, and Cole's (sometimes obnoxious) personality, it didn't sway me from appreciating the easy flow of conversation and plotline. Vulgarity: Quite a lot. 113 words total. Sexual content: Kissing and some references to more. Cole is in general quite sexual with his speech. I'm not a huge fan of YA contemporary fiction - it usually seems to be either an author advancing a personal political agenda at the expense of the story or trite, over written drama. However Bacon Pie was neither of these things. Instead I was presented with a cute, quirky tale with a hate to love romantic story line. Weirdly it reminded me a bit of Ten Things I Hate about You - perhaps it was the Shakespeare references? Lia is a tomboy computer game nerd with zero tolerance for fools. Kiev is a theatre enthusiast and accidental smart mouth. An unfortunate encounter sees them both volunteering at the Piggy Palooza or bacon festival (only Texas...) as punishment. As if that's not a weird enough meet-cute there's plenty of drama from other characters too - Vienna - Kiev's sister, Cole - his best friend, Sophie - a cheerleader with terrifying eyebrows, Dom and Alex - Lia's dads, Barnabas - her best friend and Pepe - easily my favourite character. While this book doesn't shy away from themes such as family dynamics, depression, divorce, cultural identity and sexuality, it's a fun, light read that doesn't stray too deep into those waters either. The characters are engaging and well rounded - even Cole had grown on me enough by the end of the book that I could tolerate him in small doses. The plot is simple but delivered with humour and warmth in an easy style that keeps you turning the pages. I have no idea if this was deliberate on the authors' parts or whether it was coincidence or subconscious but at the beginning Kiev is auditioning for Hamlet. As events unfold he finds himself concentrating on A Midsummer Nights Dream. The plot loosely parallels this going from a not quite a tragedy but certainly Kiev leads you to believe its going to be a teen drama that takes itself seriously (which is what Hamlet is, easy to forget because of Shakespeare's prose but Hamlet is an immature brat) to what amounts to a romantic comedy of errors with several surreal and bizarre sidetrips (a Midsummer Nights Dream). If that was in fact deliberate it's a stroke of genius in terms of foreshadowing and deepening theme. And if it wasn't then I hazard that the authors' minds work in strange and fascinating ways and they should write more books together. Such a fun, realistic and contemporary read! 5 stars all the way! Well, I don’t know how I feel about bacon on my pie but one look at this cover and I had to read it! Thank you Candace for sending me an ARC of your latest book! I thoroughly enjoyed it. The first thing I loved about this book was how accurately it portrays the average teenager. Are teens sarcastic (I think it’s their first language)? Yes! Do they drink irresponsibly and then pay for it later? Of Course! It’s a rite of passage. Are Such a fun, realistic and contemporary read! 5 stars all the way! The first thing I loved about this book was how accurately it portrays the average teenager. Are teens sarcastic (I think it’s their first language)? Yes! Do they drink irresponsibly and then pay for it later? Of Course! It’s a rite of passage. Are they perfect? Nope, but they are fiercely loyal to their friends, have complicated issues that are in fact important, and they usually try their best to be a decent person. Obviously, there will be exceptions but I feel like all of the characters in this story were very real and my former teen self could relate to most of their issues. Very refreshing and in my opinion, super important when a writer wants their readers to connect. All of the characters were vibrant and unique kids, with interesting family dynamics. Kudos to the authors for nailing it here. I also appreciated how diverse the characters were. Not merely defined by whatever clique they belonged to. Bacon Pie is a laugh out loud, feel good read by Candace Robinson and Gerardo Delgadillo. Candace is one of my favourite authors, but Gerardo is a new author to me and I was excited to see what magic he would create with Candace who I already know to be a very talented author. Lia first appears to be a angry and hostile person, but we slowl Bacon Pie is a laugh out loud, feel good read by Candace Robinson and Gerardo Delgadillo. Candace is one of my favourite authors, but Gerardo is a new author to me and I was excited to see what magic he would create with Candace who I already know to be a very talented author. Lia first appears to be a angry and hostile person, but we slowly realise that she's just a very strong character who doesn't care about what others think of her. She follows her own interests and has no desire to be one of the popular crowd. She has her best friend, Barnabas, and doesn't appear to need anyone else. She's always shown hostility towards Kiev and he's never understood why because they've never really spoken to each other before. Then, one day, Lia does something she never thought she'd be capable of and everything changes. Kiev first appears to be one of the popular guys, but it soon becomes clear that he's not. He's too busy trying to find ways of escaping from his life and the situation at home. He's also trying to figure out what's going on with his sister, Vi, who has shut him out completely. Kiev’s best friend, Cole, is always there for him, but it requires a lot of patience when ‘dealing’ with Cole who delivers plenty of funny moments that leave you feeling sorry for poor Kiev. I loved this book from start to finish, and enjoyed how the authors didn't give us all the answers at once. We get to see Kiev and Lia’s relationship develop as they learn more about each other and past assumptions are cleared up. Candace Robinson and Gerardo Delgadillo prove that hate can turn into love when given the chance. All it takes is one incident/moment to set the ball rolling and take your lives in a very different direction. I wasn't sure what the title of Bacon Pie had to do with the story, but I can now say that it's a perfect title and all becomes clear when you read about the Piggy Palooza Festival. Due to being in the UK, I don't know if such a festival really exists, but it sounds great fun and somewhere I'd love to visit. The authors describe everything so well that I was able to visual what Kiev and Lia were seeing and experiencing. I know what you're thinking..."What is this strange book called Bacon Pie that also LITERALLY has a piece of bacon pie on its cover?!" Well, it's a quirky new contemporary written by two talented Authors. Our chapters alternate perspective between Lia "Ophilia" Abbie and Kiev Jimenez in a way that leaves no illusions as to what these two characters think and feel because you often get to see part of the same situation from both characters. I think this was done very well because it doesn't feel I know what you're thinking..."What is this strange book called Bacon Pie that also LITERALLY has a piece of bacon pie on its cover?!" Well, it's a quirky new contemporary written by two talented Authors. Our chapters alternate perspective between Lia "Ophilia" Abbie and Kiev Jimenez in a way that leaves no illusions as to what these two characters think and feel because you often get to see part of the same situation from both characters. I think this was done very well because it doesn't feel repetitive, which is awesome! These two authors played really well off of each other! I really enjoyed our two main characters and a lot of the supporting characters were just as wonderful. I will admit Cole annoyed the heck out of me at first with his insistence on calling people by their whole name plus Miss, Mrs, Mr in front of it any time he addressed someone but by the end of the book it just had me laughing like "oh that silly Cole". Needless to say this was a very cute and funny romance and I just really liked the fact that these two were forced to go volunteer at the cringe worth Piggy-Palooza Festival. I will admit I am not the biggest fan of contemporaries and can be fairly picky in what I do and don't like in this genre but I tore through this story and was entertained the entire time, so I definitely would recommend this book to others! Review to come .... Loved Bacon Pie! You guys, this story was so stinkin' cute. There's an amazing cast of characters, a pig themed festival, and a pet armadillo named Pepe. That alone is worth the price of admission. Lia definitely makes my list of favorite characters. She is unapologetically herself and tells it like it is. I also love her dads. So much. Between them and Barnabus, I'm about ready to move into that apartment complex. I could not put this one down and absolutely loved the ending. This was such a nice read and left You guys, this story was so stinkin' cute. There's an amazing cast of characters, a pig themed festival, and a pet armadillo named Pepe. That alone is worth the price of admission. Lia definitely makes my list of favorite characters. She is unapologetically herself and tells it like it is. I also love her dads. So much. Between them and Barnabus, I'm about ready to move into that apartment complex. I could not put this one down and absolutely loved the ending. This was such a nice read and left me feeling all happy and such. I look forward to reading it again, especially when I need a pick-me-up. Another hit from Candace Robinson, complete with quirky characters and her unique writing style. This book was written by two authors but their voices blend together seamlessly, and their writing styles compliment each other nicely. Barnabas was my favorite character 😍 I'm always obsessed with Candace's side characters. If you like contemporary young adult fiction, this is a winner. Be sure to have some bacon in the fridge, because this book will give you the craving! This was the first time I read a book by either author and I have to say I'm pleasantly surprised. Bacon Pie is a Young Adult Contemporary novel. I enjoyed that this book has a mixture of romance, humor and a little adventure. This book is about Kiev and Lia. Kiev loves the theater and is preparing for a role in the school's next play. Horatio is a character he has invested in and is crushed when he finds out this part is already taken. Theater seems a way for him to deal with his emotions surrou This was the first time I read a book by either author and I have to say I'm pleasantly surprised. Bacon Pie is a Young Adult Contemporary novel. I enjoyed that this book has a mixture of romance, humor and a little adventure. This book is about Kiev and Lia. Kiev loves the theater and is preparing for a role in the school's next play. Horatio is a character he has invested in and is crushed when he finds out this part is already taken. Theater seems a way for him to deal with his emotions surrounding his home life. Lia loves her old school video games and her life involves spending time gaming, with her best friend Barnabas and living with her mom and two dads. She doesn't see herself as a girly girl and is happy with her Nintendo. Bacon Pie is a fast paced book that is told from Lia and Kiev's POV. I loved this aspect of the story. It's a lot of fun to see how they're both thinking. This story seems to be a enemies to lovers type of story, but that makes it so much fun. When Lia punches Kiev they're forced to volunteer at the Piggy Palooza Festival. Neither of them want to be there. I loved seeing the characters change as they got to know each other. They don't want to like each other, but they can't stop the fact that they get along and are starting to like each other. The fighting and joking between them is a lot of fun. Bacon Pie had me laughing out loud quite often. On top of the fun relationship between Lia and Kiev, I loved the other aspects of this book. Kiev has a pet armadillo, how unique is that? Lia's dads are a lot of fun and Barnasbas is his own unique self. In all honesty, I didn't care for Kiev's best friend most of the story. He grew on me near the end though! There were certain aspects of this story that weren't as worked in the story as others. The fact that Kiev loves the theater really isn't in the story much except for him running lines, his family life clearly had some stuff going on and seemed solved all of a sudden and I would've liked a bit more closure with Barnanas and Sophie. I got invested in that storyline! This is a super cute story for young adult readers who are bored by high-techy or high fantasy books. Bacon Pie is down-to-earth and real! It's your classmates, it's your neighbors, it's your school in a way only YOU know it. It's hilarious and fun. And I love the fact that Kiev is so into Shakespeare (and the school play he wants to audition for) that he wears a t-shirt that reads: I Put the Shake in Shakespeare. After high-schoolers Kiev and Lia get into trouble, the principal gives them an ult This is a super cute story for young adult readers who are bored by high-techy or high fantasy books. Bacon Pie is down-to-earth and real! It's your classmates, it's your neighbors, it's your school in a way only YOU know it. It's hilarious and fun. And I love the fact that Kiev is so into Shakespeare (and the school play he wants to audition for) that he wears a t-shirt that reads: I Put the Shake in Shakespeare. After high-schoolers Kiev and Lia get into trouble, the principal gives them an ultimatum — either volunteer at the Piggy Palooza Festival or be suspended. Neither of the two are happy about either choice, but both agree to volunteer at this "everything bacon" festival and it turns out to be a crazy experience! Lots of laughs, a few "yuck!" moments, but all fun. I was especially drawn to this book because of another book I read by co-author Gerardo Delgadillo called "Summerlypse." He has a realistic YA writing style that is refreshing and catchy. as I started this read, I wasn't sure what was gonna happen. I mean the title is bacon pie after all. but it worked so well. I loved all the characters, especially Lia, Kiev, and Barnabas. and I have to mention Pepe, he's amazing! It was a nice treat to follow the time with the characters and watch them progress as people in so many ways. I loved the meaning put within the pages and how you could help but laugh pretty much every other page. This book is full of love, laughter, sarcasm, second cha as I started this read, I wasn't sure what was gonna happen. I mean the title is bacon pie after all. but it worked so well. Bacon Pie was so light-hearted and cute! Both POV characters--Kiev and Lia--were well fleshed out, funny, and enjoyable. In fact, all the characters had their own personalities and were fun to read. Everyone had their own way of dealing with things which made them very real. I think my favorite part was that their families played into the story instead of simply existing in the background. It also had my favorite romance trope so a win all around! And the Piggy Palooza Festival seemed like a goo Bacon Pie was so light-hearted and cute! Both POV characters--Kiev and Lia--were well fleshed out, funny, and enjoyable. In fact, all the characters had their own personalities and were fun to read. Everyone had their own way of dealing with things which made them very real. I think my favorite part was that their families played into the story instead of simply existing in the background. It also had my favorite romance trope so a win all around! And the Piggy Palooza Festival seemed like a good time! With a title like “Bacon Pie” how could I not be intrigued to want to pick up this book? As skeptical as I may have been (admit it, that’s what you are also thinking), this story was one that charmed me and had me falling in love with these quirky teenagers who were anything but normal. Kiev and Lia had their own lives and their own problems and although they knew of each other in school they gravitated in different circles. Until the one day they didn’t, when Lia had had enough and took a stand With a title like “Bacon Pie” how could I not be intrigued to want to pick up this book? As skeptical as I may have been (admit it, that’s what you are also thinking), this story was one that charmed me and had me falling in love with these quirky teenagers who were anything but normal. Kiev and Lia had their own lives and their own problems and although they knew of each other in school they gravitated in different circles. Until the one day they didn’t, when Lia had had enough and took a stand, which also ended up with both of them having to “serve time” oh wait I mean do volunteer work at the town’s Piggy Palooza Festival. Neither Lia or Kiev ever expected that they would develop a friendship let alone that anything more could come from their time together but stranger things have happened. Speaking of strange, Kiev’s best friend Cole is a very interesting character in every single way. He is the kind of guy that all girls like to avoid but somehow throughout this story he developed, although he did betray his best friend’s trust but it was for the most noble of noblest causes, into a great guy and he manages to bring much comic relief into a story that deals with many tough issues that teens face. The entire cast of characters in Bacon Pie are just wonderful! They are all nicely fleshed out with personalities that add to the story and make it memorable. Even Kiev’s pet Armadillo manages to inject humor into this story with his wily little ways. There are some tense moments and maybe even a little high school drama but every situation is handled in such a way that there is very little angst and you will not find yourself reliving any of your own high school nightmares. Those memories will stay in the recesses of your own mind but you will definitely enjoy your time reading Bacon Pie! This review is based on a complimentary book I received from Author, Candace Robinson. It is an honest and voluntary review. The complimentary receipt of it in no way affected my review or rating. 5 stars! Bacon pie was a very fun read. The main characters were really cute and quirky and take you back to that feeling of first love! If you’re looking for something fun and easy to read, this is the story for you! My name is Candace Robinson, obviously. I spend my days consumed by words. When I'm not writing stories, I maintain a book review blog—Literary Dust. My life consists of avoiding migraines, admiring Bonsai trees, and living with my husband and daughter in Texas—where it can be forty degrees one day and eighty the next.